Make a difference in your community and help the environment at the same time – join the Adopt-A-Highway program in Kansas. The goal of the program is to clean along the roadways throughout the state to increase safety for motorists and pedestrians as well as improve the beauty of Kansas. This helps to raise awareness on the negative effects of pollution and the positive aspects of a clean community. Any non-profit group that does not discriminate upon the basis of race, religion or gender can join and there is no cost to the group. Members must be at least 11 years old and have adequate adult supervision. Groups have clean-ups three times a year and are recognized for their efforts with signs marking their sections of highway. 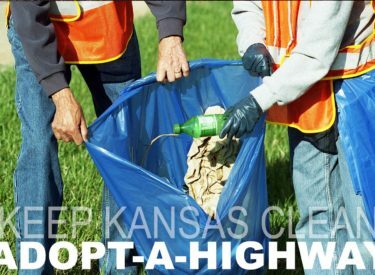 Adopt-A-Highway groups are gearing up for the annual Clean Up Kansas Campaign which takes place during the month of April. This event, as well as the program, is sponsored by the Kansas Department of Transportation. All Adopt-A-Highway groups are encouraged but not required to participate in the statewide event. Groups clean their sections of roadway three times a year at their convenience. Most choose to schedule a clean-up time in the spring, summer and fall.